It has green eyes, a girl’s name and, like other parapagurid species, piggybacks its tentacled lodgers around in a unique biological marriage called symbiosis. Meet Paragiopagurus atkinsonae, a new species of deep-water hermit crab found only in a tiny area off the West Coast of South Africa. The wee beastie (it’s around 70 mm long) bears the name of University of Cape Town (UCT) alumnus Dr Lara Atkinson, the marine researcher who first noticed it, but it goes by the common name ‘green-eyed hermit crab’. UCT PhD candidate Jannes Landschoff and Rafael Lemaitre of the National Museum of Natural History at the Smithsonian Institution in the United States described the new species in ZooKeys (23 May 2017), a scientific journal covering zoological taxonomy, phylogeny and biogeography. It is one of three hermit crabs that Landschoff is describing as new to science for his doctoral thesis. The story starts in a modestly sized area in the shallower deep waters (199 m to 277 m) off the West Coast. Our deep waters teem with hermit crabs, as shown by the Department of Agriculture, Forestry and Fisheries’ demersal abundance surveys. These biannual trawls sample the sea bottom along South Africa’s West and South coasts to assess marine stock, which helps fisheries’ planning. Atkinson is a researcher with the South African Environmental Observation Network. 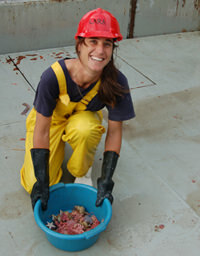 She was on board the RS Africana implementing their long-term invertebrate monitoring programme when the dense bounty of one trawl was being sorted during a three-week survey in 2013. 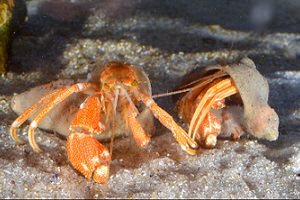 Hermit crabs of the Parapaguridae family usually account for a huge portion of the trawl. But that day she noticed something different. One of the tiny crustaceans was looking at her with green eyes. Curious, she sent it for identification. Landschoff remembers a stronger response when Lemaitre first encountered the green-eyed hermit crab. They co-authored a detailed study and subsequently showed that they were indeed looking at a new species: the 25th in the genus Paragiopagurus Lemaitre, 1966, from the family Parapaguridae, one of six hermit-crab families. This little hermit crab is a mottled orange with cream to white colouring. Besides their green eyes, they’re distinguished by biserial gills, drastic sexual dimorphism, exhibited by the large right celiphed (claw) and, in males, the presence of specially shaped, unpaired second pleopods, which are modified as gonopods that hermit crabs probably use to pass on sperm during copulation. But parapagurids are different from other hermit crabs. First, many don’t inhabit gastropod shells. Instead, they make their homes in highly unusual, non-calcified ‘shells’: soft, polypy masses that are amalgams of sand and material created by (and this is where things get interesting) zoanthids, or colonies of sea anemones, that live on the backs of these crabs. Permanently, like lodgers. It’s a win-win relationship. The deep-water sea floor is mostly sandy and barren of rocks, providing little in the way of anchorage for anemones. Instead, they anchor on the backs of these hermit crabs, using their tentacles to haul in the fishy debris floating about as the crabs feed. “So, when you hold it [the hermit crab], it’s just organic material glued together with some sand,” said Landschoff, lifting a tiny specimen from its bath of alcohol in his UCT laboratory. Even more curiously, parapagurids start off in the usual way, occupying a tiny gastropod shell. But these eventually become deposited within this non-calcified ‘amalgam’ created by the anemones. 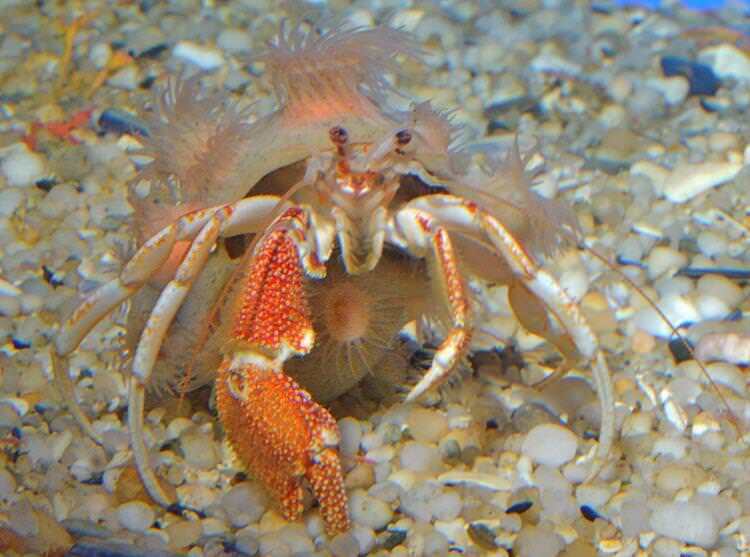 As the hermit crab grows, its live ‘shell’, or carcinoecia, grows with it. “They can reach incredible densities in offshore areas because they don’t need to find new homes,” Landschoff explained. Species of the family of deep-water hermit crabs, to which the new green-eyed species belongs, can have extremely wide distributions; some species range from South Africa to Brazil to New Zealand. Two common South African species occur from the Namibian border as far as Port Elizabeth and another occurs as far as Durban. Curiously, the habitat of the green-eyed species is restricted to a very small area off the West Coast. Given the paucity of information about South African parapagurids and their apparent similarities, Landschoff is not surprised that the new species hadn’t been noticed. What is it about the tiny West Coast habitat that seems to favour the green-eyed species? That’s another mystery, he said. Other unique creatures could also live in this habitat. And South Africa’s location offers marine biologists a veritable feast. Landschoff grew up in Germany and had always wanted to be a biologist. 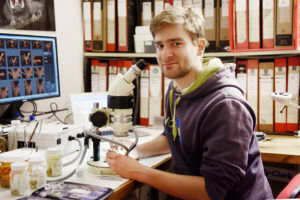 A post-school stint working on the inter-tidal flats of the Wadden Sea decided him. He came to UCT to do his master’s degree on brittle stars (echinoderms related to starfish) under Emeritus Professor Charles Griffiths and continued into doctoral studies. 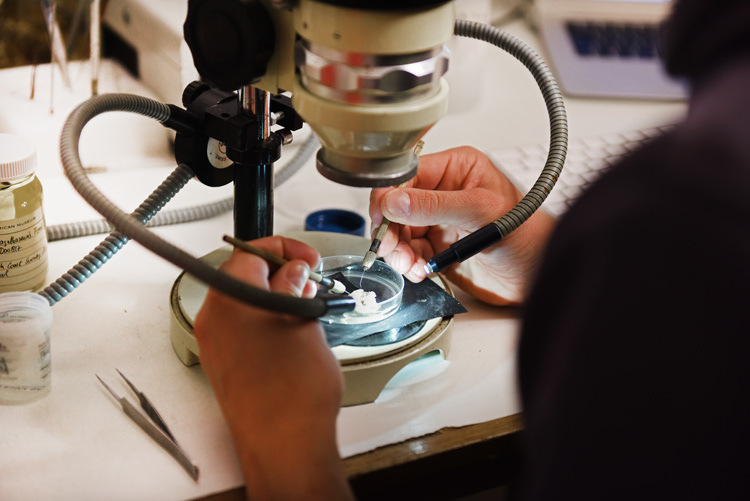 Identifying new species is time-consuming, finicky work. It took six months to fully describe the green-eyed hermit crab, and four years from the first discovery to publication. 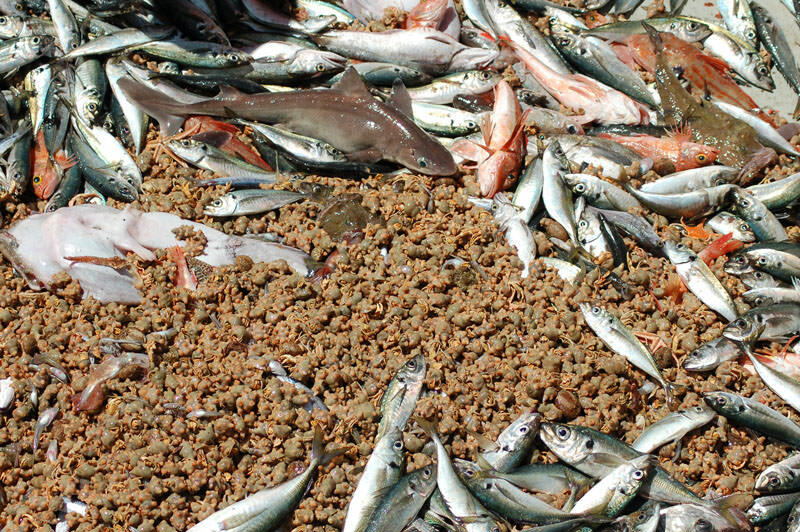 In an era of shrinking habitats and biodiversity, there is a real frustration knowing that there is so much in the oceans that hasn’t been seen, let alone described. And hermit crabs are an under-researched group. It’s an honour for a biologist to have something named after them, and that honour went to Atkins, with good reason. “Lara has put a lot of work into this invertebrate assessment for scaled data accumulation,” said Landschoff. Atkinson first started the offshore trawl invertebrate collections and classification in 2007 on board the RV Dr Fridtjof Nansen. Their work also underpins a new field guide on decapods, the higher-order crabs. Atkinson is lead editor, and Landschoff and Griffiths are co-authors, Landschoff writing the section on hermit crabs. From among his trove of reference books, Landschoff picks out a dog-eared and now coverless edition of KH Barnard’s ‘bible’ on South African Decapod Crustacea, published in 1950. It gives a good idea of how many species discoveries are being made. Taxonomic revisions are thus essential to the biology record. While much of the discovery lies under the oceans, taxonomically there’s plenty of information yet to be found in museums, libraries and collections, including the grey literature, “hidden” in government reports, old monographs and records, some dating to the 1800s, said Landschoff.